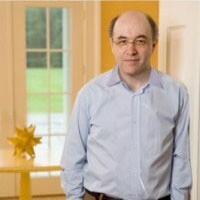 Stephen Wolfram is the creator of Mathematica and the founder of Wolfram Research. Born in London in 1959, he studied at Eton and Oxford. He published his first scientific paper at the age of 15, completed a Ph.D. in particle physics at the California Institute of Technology, and had joined the faculty and been awarded a MacArthur "genius" award, worth $128,000, by the age of 21. The MacArthur money helped Dr. Wolfram set up his company, Wolfram Research, in 1987. Its first product was Mathematica, a piece of software that solves equations, plots graphs, creates models, and analyzes data. Mathematica is hugely popular among engineers, scientists and financial analysts, and its success gave Wolfram the financial security to continue to do his own thing as an independent scientist and researcher. His most recent venture is Wolfram Alpha, a website launched in 2009 that he describes as a "knowledge engine that computes answers to questions." With many years of the project yet to run, Wolfram Research already claims to have the largest collection of curated, cross-checked data in the world. Wolfram Alpha is ambitious, but it pales next to Wolfram's boldest project: an attempt to convince the scientific establishment that computer programs, rather than mathematics, are the best way to describe and explain the complex systems that are widespread in nature. Wolfram calls this approach a new kind of science, or NKS. That is also the title of the 1,200-page book, published in 2002, in which he lays out his theories, the product of a decade's reclusive work. NKS is chiefly concerned with the behavior of very simple computer programs, called cellular automata, that exist in a myriad of variations. Although most are uninteresting, a few of them can exhibit great complexity. One of them produces an endless stream of random output, and another has proven to be the simplest ever universal Turing machine, a hypothetical device capable of solving any computational problem that was defined by Turing in 1936. Wolfram believes that all the vastly different complex processes seen in nature are the products of such simple computations. He proposes that the universe is underpinned by a set of simple computational rules capable of producing vast complexity, and that nature is just "sampling what's out there in the computational universe." He claims that applying NKS widely could lead to advances not only in mathematics and computing but also physics, biology and even the social sciences. "I have come to view NKS as one of the more important single discoveries in the whole history of theoretical science," Wolfram declares in his book with characteristic immodesty. Needless to say, not all his peers agree. To say that NKS is far from widely accepted would be an understatement of Wolframic grandiosity. AR Read my 2004 review of NKS here and here.